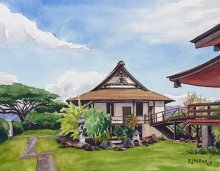 Artwork Dimensions (unframed): 8" x 10"
The annual summer bon dance festivals draw crowds of people in kimono to nine Japanese Buddhist temples around Kauai. The bon dance is part of a traditional celebration honoring the spirits of one's ancestors. 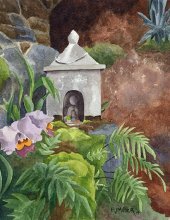 Lihue Hongwanji is the oldest Japanese Buddhist mission on Kauai, established in 1900.